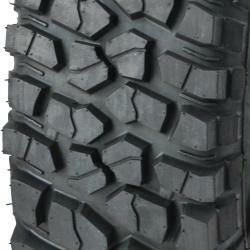 New tire 4x4 profile recommended for muddy and snowy areas. Slightly less noisy at the asphalt than typical off-road tires MT. Very good profile for muddy area. Work well enough on asphalt. The best off-road tire for universal using. Especially recommended to hunters, forest rangers and people for whom keeping off-road characteristics is important as well as having a little bit of comfort at the asphalt. Work the best with using 70% at the terrain and 30% at the asphalt.